St. Bernadette was the eldest of four children who survived infancy. She actually was one of nine children, but five of them did not survive infancy. She was born on January 7, 1844 in France. Hard times had fallen on France and her family lived in extreme poverty. She contracted cholera as a toddler and suffered severe asthma the rest of her life. A few years later, by the time of the events at the grotto, her family’s financial and social status had declined to the point that they were living in a one-room basement. On February 11, 1858, Bernadette at the age of 14 was out gathering firewood and bones with her sister Marie and a friend near the Grotto of Massabielle when she had her first vision. While the other girls crossed the little stream in front of the Grotto and walked on, Bernadette stayed behind, looking for a place to cross where she wouldn’t get her stockings wet. She finally sat down in the Grotto to take her shoes off in order to cross the water and was lowering her first stocking when she heard the sound of rushing wind, but nothing moved. A wild rose in a natural niche in the Grotto, however, did move. From the niche, in the dark alcove behind it, “came a dazzling light, and a white figure”. This was the first of 18 visions. She called it, “a small young lady”, but her sister and friend said they had seen nothing. On February 14, after Sunday Mass, Bernadette with her sister Marie and some other girls, returned to the Grotto. Bernadette knelt down immediately, saying she saw the lady again, and fell into a trance. When one of the girls threw Holy Water at the niche and another threw a rock from above that shattered on the ground, the apparition disappeared. Bernadette fell into a state of shock and the girl who had thrown the rock thought she had killed her. On her next visit, February 18, she was asked her to return to the Grotto every day for a fortnight, meaning fourteen days. This period of almost daily visions came to be known as the “Holy Fortnight”. Bernadette’s parents were embarrassed and tried to forbid her to go. The local police commissioner called her into his office and threatened to arrest her, but since there was no evidence of fraud, there was nothing they could do. She remained calm and consistent during her interrogations, never changing her story or attitude, and never claimed knowledge beyond what she said the vision told her. The supposed apparition did not identify herself until the seventeenth vision, but the locals assumed she saw the Virgin Mary. The town’s people were divided in their opinions, some thought she had a mental illness and demanded that she be put in an asylum. Soon a large crowd of people followed her on her daily journey, thinking they were witnessing a miracle. The content of Bernadette’s reported visions were simple, and focused on the need for prayer and penance. On February 24th, Bernadette kissed the muddy ground of the Grotto. The next day she went further, and during her trance, chewed and ate grass she plucked from the ground. She then rubbed mud over her face and swallowed some mud, to the disgust of the many onlookers. She explained that the vision had told her, “To drink of the water of the spring, to wash in it and eat the herb that grew there”, as an act of penance. To everyone’s surprise, the next day the Grotto was no longer muddy, but clear water flowed. In the 150 years since Bernadette dug up the spring, 67 cures have been verified by the Lourdes Medical Bureau as inexplicable. The Church also, after “extremely rigorous scientific and medial examinations” has failed to find any other explanation. The water was tested, and it had a high mineral content, but it contained nothing out of the ordinary that would account for the cures attributed to it. Bernadette herself said that it was faith and prayer that cured the sick. On March 2nd, at the thirteenth apparition, Bernadette told her family that the lady had said, “Please go to the Priests and tell them that a chapel is to be built here. Let processions come her”. She went to her parish Priest, Fr. Dominique Peyramale with the request. The Priest told Bernadette that the lady must identify herself. She asked as requested, but the lady just smiled and said nothing. He also asked that she perform a miracle, requesting that she make the rose bush beneath the niche flower on the last week of February. The sixteenth vision was on March 25th, and lasted for over an hour. During this vision the “Miracles of the candle” is reported to have occurred. Bernadette was holding a lit candle. During the vision it burned down and the flame was said to be in direct contact with her skin for over fifteen minutes, but she showed no sign of experiencing any pain or injury. During this same visitation, she again asked the woman for her name but the lady just smile. She repeated the question three more times, and the lady said, “I am the Immaculate Conception”. It was four years earlier, that Pope Pius IX had defined the dogma of the Immaculate Conception, “that, alone of all human beings who have ever lived (save for Jesus, Adam and Eve), the Virgin Mary was conceived without the stain of Original Sin”. Bernadette’s parents, teachers, and Priest all later testified that she had never previously heard that expression, “Immaculate Conception” from them. In fact, she was thought of as being simple minded. Today, she is the role model that Church authorities judge visionaries and mystics. Bernadette’s visions are viewed as being of high level of significance. Her request to the local Priest to build a chapel at the site of her visions eventually gave rise to a number of chapels and Churches at Lourdes. The “Sanctuary of Our Lady of Lourdes” is now one of the major Catholic pilgrimage sites in the world. One of the Churches built at the site, the Basilica of St. Pius X, can itself accommodate 25,000 people and was dedicated by the future Pope John XXIII when he was the Papal Nuncio to France. Over 5 million Pilgrims visit Lourdes (population of 15,000) every year, with individuals and groups coming from all over the world. Within all of France, only Paris has more hotels than Lourdes. Disliking the attention she was attracting, Bernadette went to the Hospice School run by the Sisters of Charity of Nevers, where she finally learned to read and write. She joined these Sisters at the age of 22. She spent the rest of her life there, working as an assistant in the infirmary and later as a Sacristan, creating beautiful embroidery for Altar cloths and Vestments. She later contracted Tuberculosis of the bone in her right knee. She followed the development of Lourdes, but was not present for the consecration of the Basilica of the Immaculate Conception. She eventually died of her long-term illness at the age of 35, on April 16, 1879. He body was laid to rest in the St. Gildard Convent. The body of Bernadette Soubirous was exhumed on September 22, 1909, in the presence of representatives appointed by the postulators of the cause, two doctors, and a Sister of the Community. They claimed that although the crucifix in her hand and her Rosary had both oxidized, her body was incorrupt. They washed and re-clothed her body before burial in a new double casket, and the Church exhumed her body the second time on April 3, 1919. She was still found to be incorrupt. In 1925, the Church exhumed the body for a third time. They took relics, which were sent to Rome. A precise imprint of the face was molded so that a wax mask could be made. Wax casts were also made of her hands. The remains were then placed in a gold and crystal reliquary in the Chapel of St. Bernadette at the Mother house in Nevers. Many pilgrims visit the site and the body of St. Bernadette is still shown despite being 130 years old. 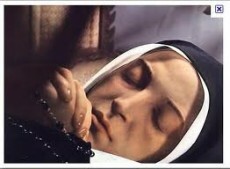 St. Bernadette Soubirous was born in France, on January 7, 1844. She was known as the visionary who seen the Blessed Mother at a Grotto in Lourdes. She along with her sister and friend, were gathering firewood when she heard the rush of wind, but nothing was moving. She experienced a set of 18 visions that were basically centered on repentance and prayer. She also was told that a miraculous spring would erupt, and that out of this spring many would be healed. The spring welled up just as she was told, and the water to this day is the cause of many healings. St. Bernadette said it is the faith of those that are healed that makes this possible. Today, it is the most visited pilgrim center in the world, and over 5 million pilgrims visit each year.